The Compulsive Reader: Shelf Discovery: Steampunk! I've been kind of on a steampunk kick lately. I just (sadly) finished the last book in the Parasol Protectorate series by Gail Carriger, and I also got my co-worker hooked on the books. While going through some research papers I wrote a year ago on Imperial Russia I got it in my head that a steampunk novel set in that time would be quite interesting--the geographical setting, the clothes, and the culture would all be really awesome for a steampunk novel. Then we got a few cool steampunk anthologies in at the bookstore that have been vying for my attention...it's just been on my mind! 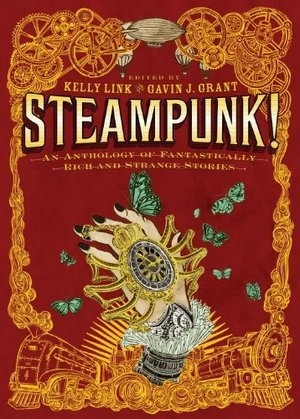 So, this week's Shelf Discovery has to be Steampunk!, an anthology edited by Kelly Link and Gavin Grant! It has more YA authors in in than the other two we got in, and I am so excited to pick it up soon! "Imagine an alternate universe where romance and technology reign. Where tinkerers and dreamers craft and re-craft a world of automatons, clockworks, calculating machines, and other marvels that never were. Where scientists and schoolgirls, fair folk and Romans, intergalactic bandits, utopian revolutionaries, and intrepid orphans solve crimes, escape from monstrous predicaments, consult oracles, and hover over volcanoes in steam-powered airships. Here, fourteen masters of speculative fiction, including two graphic storytellers, embrace the genre’s established themes and refashion them in surprising ways and settings as diverse as Appalachia, ancient Rome, future Australia, and alternate California. Visionaries Kelly Link and Gavin J. Grant have invited all-new explorations and expansions, taking a genre already rich, strange, and inventive in the extreme and challenging contributors to remake it from the ground up. The result is an anthology that defies its genre even as it defines it." What do you think? Sounds excellent, no? If you're into steampunk, check out an earlier post about Steampunk Poe. You're right...Russia would be an awesome setting, especially with the area's clash between Eastern and Western culture. It does sound pretty awesome! :) I haven't read any steampunk though. Maybe I should get this since an anthology shows like a good way to cut one's teeth on a unfamiliar genre. I read this one and it's got some great imaginative new steampunk stories from some great authors in it!! I would like to recommend the Clockwork Century series by Cherie Priest. Steampunk in Civil War era Seattle. They're funny, clever and somewhat compelling.